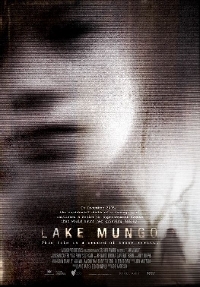 Lake Mungo is yet another extremely well made Australian film that transcends genre and totally blew me away. It's a mystery / ghost story / horror film told in a documentary style that doesn't need to rely on gimmicks to get under your skin. It just tells a compelling and totally plausible story full of unexpected plot twists and enough unexplained phenomena to keep you guessing. It took me a while to realize it but Lake Mungo is actually a lot like Twin Peaks if Lynch had made his supernatural murder mystery tv series as a documentary. Not exactly of course, but Lynch's Peaks was obviously a major influence on the project. I mean, director Joel Anderson not only gave his victim the surname of "Palmer" (as in Laura Palmer), but the film is about how the drowning death of a teenage girl unearths many of her secrets and questions about of the very nature of the universe. So if you're a Twin Peaks fan, it's safe to say you'll like this film. Lake Mungo is a much more intimate tale than Twin Peaks though. It's primarily about just the Palmer family and tells the story of strange events that happened to them after the tragic death of their daughter. Even after her death, they feel the presence of Alice in the house and become increasingly convinced that she's still with them. They begin to see her specter in photographs and in the background of video taped footage. They start setting up cameras in the house and the more footage that is examined, the more secrets get revealed, not all of them supernatural. They soon discover that young Alice Palmer had secrets and may have even had a brush with the supernatural months before her death. The story is told using interviews, news B-roll footage, still photographs, and found footage a la Blair Witch and is done so well that I guarantee there will be people who catch this on late night tv one night and think it's a true story. All the actors are completely convincing and very natural. But the real props need to go out to director and writer Joel Anderson who, despite the documentary aspects, meticulously molds the film's mysteries in a classic three act narrative style which keeps the tension constantly building. Lake Mungo is also a powerful drama though. It's a film about loss and the ways families deal with grief so it'll stay with you long after the mysteries are solved. The film is already in line for a remake of sorts scheduled for 2011. I say "of sorts" because we've just been told by Vertigo Entertainment that the film will be a narrative retelling of the events, not another faux documentary. Making a film about the fictitious events that take place in a faux documentary might actually be a first in film history. Joel Anderson is attached to direct the American version so we have every reason to believe this "remake" will be respectful to this original version. My advice to you is to keep an eye out for this original version of Lake Mungo and watch it before the American one comes out so as to enhance the total experience. i thought this film was done so well. i believed it was a doco right up until i read the credits! i dont know if the u.s. version will be as good but i am excited to see how it turns out. Unbelievable! I thought it was completely true until i walked out of the cinema and someone told me that it is a faux documentary. Absolutely brilliant! Joel Anderson and his producer held a lecture type thing at Melbourne RMIT a week ago, talking about how they went making this film. We saw several snippets and they looked amazing. i'm so glad it was shot on film, the quality looks much higher than the budget they had to work with. Good luck selling the movie guys! Well disciplined, slowly revealing, and humanly emotive, this film carries subtleties that mask any betrayal to previous films, creating a gripping film in itself. Unreal, I was a true beliver, told every body I new about this poor girls struggle and the familys desperation. Could watch it again and again. wow i really thought it was fareal it was truly chilling! Wow. I just finished watching the film, and have every light on in my house. I was 100% convinced and started researching straight away. Now i know it isn't real, but still can not shake off this horrible feeling i have. Brilliant movie though. I am so relieved.